I always start my cleaning in the kitchen. It’s the room we use the most and the one that becomes the messiest and most cluttered quickest. Once the kitchen is clean and organized, my house instantly feels and looks better. However, I notice that it’s also so easy for the mess and clutter to get out of control. 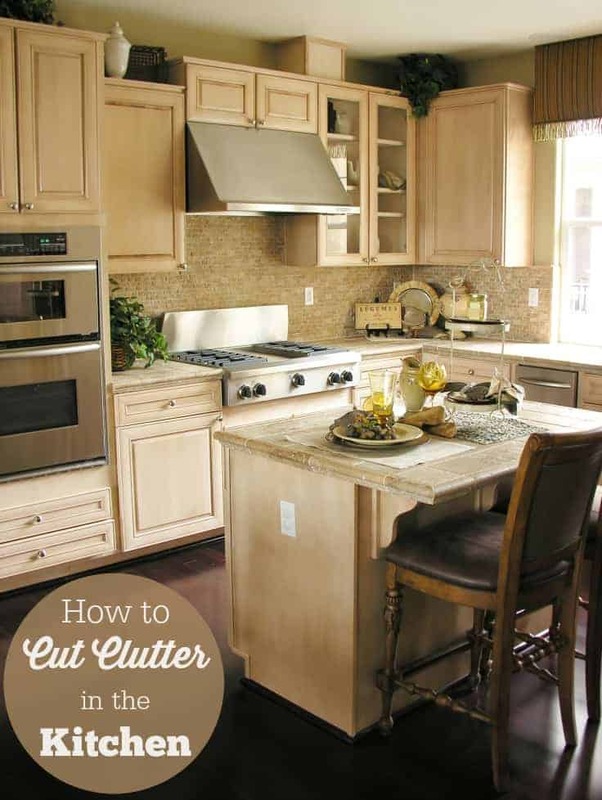 Today, I have a few tips to share on how to cut clutter in the kitchen. It will be easier for you to keep neat and tidy once you purge and reorganize! Start decluttering your kitchen by surveying the area. What needs to be taken care of first? I like to tackle the paper clutter first. If I don’t, and it gets pushed to the end of my cleaning day, I might just change my mind and save it for “later”. Which, we all know, “later” is really for binge watching Netflix… not cleaning. Ready to rock and roll? Start a timer! Whether it’s for 15 minutes or an hour, set a timer and keep cleaning until it goes off. Tackle papers by creating piles. Mail/pay, shred, file. Those are the piles I use, but obviously you can switch those up to work for your needs. If you have a lot of school papers from the kids, start a binder with sheet protectors to keep them all together – then move them to the attic or another storage area for long-term keeping. If you have a lot of mail, start a mail station either in the kitchen or somewhere else – and make sure the mail lands in the “inbox” as soon as it comes in the house. If it’s junk, throw it away immediately. If you can, just touch each piece of mail once! This will save you tons of time. Appliances that you don’t use daily – or at least almost daily – do not need to be out on the counters. So, think about your toaster, your coffee maker, your blender… do you use them daily? If not, tuck them away in the pantry or in a cabinet. One thing that has saved my sanity when it comes to kitchen clutter is a kitchen command center. Now that you’ve cleaned the countertops off, it’s time to move towards the cabinets – above and below the countertops. When you open your cabinets, what do you see? Food – some people store food in the cabinets. Make sure it’s all good. Obviously, get rid of the stuff that is expired. Spices — get rid of the ones you haven’t used all year. Organize the ones you have. Cups — how many cups do you really need? Plates/bowls — same with cups… how many do you need? Donate the rest. Random pieces of appliances like food processors — make sure you have ALL of the pieces. If not, ditch it. Tupperware containers — match them up with lids. If they don’t have lids, they serve no purpose. Trash! For those cabinets that have tons of odds and ends, use pretend pull out drawers and label everything to keep it organized. Use drawer dividers to group things together such as tea bags, spice packets, or Kool-Aid packs. Put a cork board on the inside of your cabinets. Attach a few hooks and voilá! You’ve got yourself some organization. Get under the sink and get rid of any products you no longer use. This under sink rod is a great way to hang spray bottles. When was the last time you tackled any kitchen organization projects? I hear you on the plastic containers! We match them up at least every other month and chuck the lids without containers and containers without lids. It still always turns into a disaster, because the container we need is always the bottom one! I just bought a couple of wire frame pull-out baskets to install in my plastic ware cabinet – I think it’s going to help tame that jumble a lot. I chuckled a bit about the cups and bowls though. Other households are probably different, but with two boys who let them pile up in their bedrooms a bit I need lots of extras on those items. Great tips! Tackling the kitchen and getting it organized is on my to do list! It’s like I have kitchen gremlins who follow me around and clutter up everything I just de-cluttered. Oh, of course I do and they’re my husband and daughter. I got my clutter under control on Thursday when I was expecting company for dinner. It is amazing what we can look at day after day and disregard. When someone else is expected we can see things with “new eyes”! I find the hardest pile is the kid’s work, as my children get older the pictures get cut back in number but the tests take up the slack – it gets harder to decide to keep in a box or throw (when they aren’t looking I mean…) into a recycling pile. I am diligent about keeping the kitchen tidy, but why does everything end up on the kitchen table. I have it nicely arranged and that is the spot everything gets dropped on? I recently bought a condo and have been struggling to keep my smallish kitchen in order. I have been buying extra bins and containers to keep things organized, but could definitely use more ideas! Piles of papers are my biggest issue. They should all have a place, but hubby just puts them wherever there is a clean place. Drives me nuts! These are all great tips and now it is time for me to also rid of clutter in my kitchen and in the cupboards I like the rods under the sink tip especially. Thanks for the tips. I do find, however, that i I don’t leave my blender out, I won’t take the trouble to dig it out when I do need it. I agree with the containers and lids. I check those often. Thank you for the tips! I am always fighting with space and all the containers, lids, bowls, plates, etc.